This delightful dish serves 3-4 people! During the historic centuries of the spice trade, cinnamon, ginger, pepper, turmeric, and other curry spices were imported from India to Europe. In India, each chef combined these spices differently to create flavorful dishes, like curries and dahls, sometimes using upwards of fifteen distinct spices in one recipe. When these spices reached Britain, people were overwhelmed by a number of flavor combinations available to their previously spice-less cooking. To decrease confusion, Britons created ready-made spice mixes, like curry powder, which all home cooks and chefs alike could use in their dishes, making curry a household name in the UK. From there, curry powder was exported to Japan, allowing the Japanese to develop their own take on curry. Since its origination in the Meiji Period, curry has undergone extensive re-imagination by Japanese culture and is now recognized as a national dish of Japan. It is most commonly served in the form of curry rice (karē raisu, カレーライス), but may also be served as curry udon or curry bread. 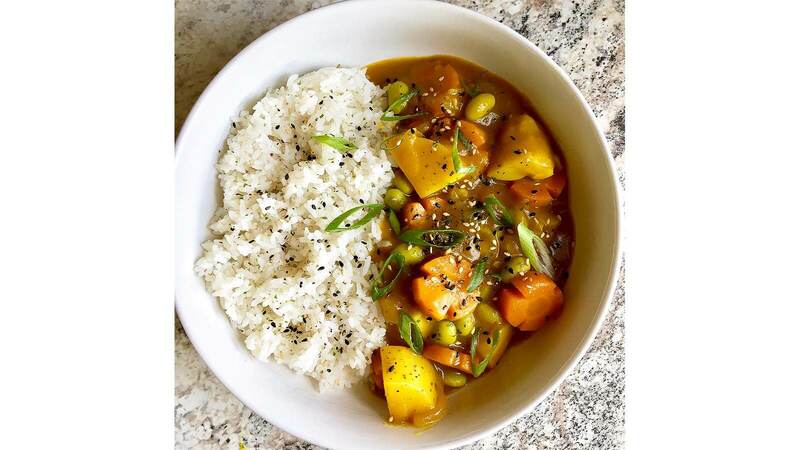 The components of Japanese curry include a roux-thickened tomato-based sauce with large cuts of potatoes, carrots, and onion cooked as a stew with a protein and seasoned with curry powder. It is served with white rice and fukujinzuke, a mixture of daikon, eggplant, lotus root, and cucumber pickled in a soy-flavored sauce. Sounds delicious, right? It’s incredibly easy and rewarding to make curry at home. The typical approach is to use a curry roux block, like S&B Golden Curry Sauce Mix, which allows you to add cooked vegetables, protein, and roux blocks to water. However, the sauce you make yourself will taste so much better than any store bought sauce mix. The first step is to make a roux, which is how the curry sauce becomes thick. It’s a mixture of flour and fat. In this recipe, we use mochiko, also known as sweet rice flour (gluten-free). You can substitute it with King Arthur’s Gluten-Free Multi-Purpose Flour, or standard all-purpose (AP) flour (not gluten-free). Standard AP flour will brown as you cook it, whereas mochiko stays pale. Curry powder is essential to the complex flavor of this dish. Traditionally, S&B Oriental Curry Powder is used, but it’s easy to make your own curry spice mix too! There’s a great article breaking down the Japanese curry powder formula here. I enjoy a less spicy version made of turmeric, cinnamon, cumin, and nutmeg. It accentuates the spiciness of the fresh ginger and garlic used in the recipe without making my stomach acidic. S&B is made of turmeric, coriander, fenugreek, cumin, red pepper, black pepper, cinnamon, ginger, star anise, cloves, cardamon, fennel, nutmeg, laurel leaves, allspice, and garlic. So, feel free to experiment with your own flavor combinations, or keep it simple and just use S&B. Apple works great as an extra thickening agent for the curry sauce, so it’s best to get the apple processed as finely as possible. This can be achieved by using applesauce, grating it with a micro plane, or using a food processor. I’m lazy and used applesauce, but using a fresh apple imparts the best flavor. For the protein in this dish, I chose edamame because it’s a good source of micronutrients, fiber, and antioxidants. Plus it’s so delicious! If you are allergic to soy or just prefer something else, use peas for a vegetarian alternative. Beef, chicken, or even breaded pork cutlets (if you’re adventurous) can also be substituted or even added to the existing recipe. Just add the cooked meat to the curry at the same point as the processed apple. Garnish with green onions, sesame seeds, or ichimi togarashi (Japanese chili pepper flakes) for some kick. Heat sesame oil in a small saucepan over very low heat. Stir in the mochiko, and cook over very low heat for about 4 minutes, or until bubbles form and stick together. Be sure not to brown the sweet rice flour. *Note: If using all-purpose flour, the roux will brown slightly, and cook time will increase to about 6 minutes. Stir in curry powder until incorporated and cook for another 1 minute. Coat the bottom of a large pot or Dutch oven with neutral oil and heat on medium until oil shimmers. Add onions and cook about 5 minutes, stirring frequently, or until onions are translucent. *Note: For an extra boost of sweetness, cook onions until they are caramelized. Don’t stir as often for this result. Add garlic and ginger and cook another 1 minute, until aromatic. Stir in carrots and potatoes and cook another minute to soften them slightly. Add tomato paste and extra curry powder, if desired, and stir until combined. Add broth and bring to a gentle boil over medium-high heat. Once boiling, cover, reduce heat to low, and simmer for about 10 minutes. It’s ready when the vegetables are tender, yet still firm. Stir in processed apple and Worcestershire sauce. Cook uncovered for 2 minutes, then stir in edamame. Using a whisk or wooden spoon, constantly stir the curry while adding the cooled roux to the pot. Continue stirring until the curry is smooth. Increase heat to medium and continue to cook for another 5 minutes to thicken the curry and fully cook the vegetables. Stir frequently, and pull it off the heat when the vegetables are tender and the curry base has thickened. Season with salt and pepper as desired, and serve with rice and the garnish of your choosing.